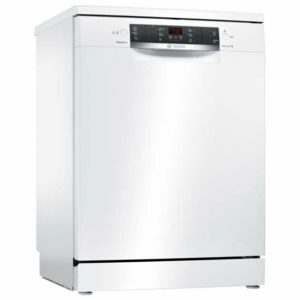 This superb Bosch dishwasher offers incredible performance and flexible storage thanks to Vario Flex adjustable baskets and nifty features like the Dosage Assist, which ensures the complete diffusion of the tablet or powder. The brilliant A++ energy rating keeps costs low and when you don't have as much time, the fantastic Vario Speed option reduces run time of the programme without losing performance. This superb white freestanding dishwasher from Bosch offers a total of 6 different programmes, space for 14 place settings and A++ energy rating. Powered by the reliable and efficient Eco Silence Drive, the incredibly flexible storage of the Vario Flex baskets ensures your dishes get fantastic cleaning performance as Dosage Assist completely dissolves the tablet or powder. When you need to reduce the run time of the programme, just select the Vario Speed option, without any loss of performance. Perfect for busy households, parties and big breakfasts!